Personal Information is any information that personally identifies you. It can be your first and last name, your home address, your telephone number, age, gender or your email address. Personal information is collected when users voluntarily register for membership services. Sometimes this Personal Information is needed to send you announcements regarding our website and operations, enter contests and participate in other promotional opportunities. Other times, we may collect this information to help target advertising and marketing. We may also collect email addresses from users who send us support messages or request technical or other assistance. This information enables us to improve our website in order to make your online visits more productive and enjoyable. If we are asking for optional information, we will inform you so you know you can choose to skip it. Customize the content and/or layout of our website for each individual user. Process and fulfill orders placed on our website. Notify users about updates to our website or promotional offers or opportunities that we believe will be of interest to users. Aggregate Information is anonymous data that we use to diagnose problems on our website’s servers, administer our website, and improve the quality of our website. It may be your IP address (a number that’s automatically assigned to your computer whenever you are surfing the Internet), browser type (e.g., Mozilla or Internet Explorer), and domain (e.g., XYZ.com). We do this in the background so it does not interrupt your online experience. We may share Aggregate Information with third-parties. None of this information is connected with Personal Information. So, when you enter our site, you are anonymous and will remain that way unless you choose otherwise. We may share the Aggregate Information we collect with third-parties for advertising and promotional purposes. We may use a third-party company to serve ads when you visit our website. This company may use Aggregate information about your visits to our website in order to provide advertisements on our website about goods and services of interest to you. For this purpose, we, and the third-party company may track and note some of the pages you visit on our website. You can opt-out of these services by visiting the Digital Advertising Alliance’s opt-out portal. As a measure of user interest, we may track search terms that are entered into our website’s search features. Search data and user-provided information help to improve the relevancy of search results by learning user preferences and prioritizing search results accordingly. The intended result is to provide a more efficient search feature for visitors to our website. With user permission, we may access Personal Information on behalf of third parties for marketing or promotional purposes. We will always request permission to share such information with third-parties. You may elect not to participate by clicking or not clicking, as applicable, the appropriate link or button. In some situations, we may share your Personal Information with third-parties who perform a particular service on our behalf. These parties are not allowed to use Personal Information except for the limited purpose of providing the particular service on our behalf. We may receive personal usage and demographic information from third-parties based on our users Personal Information and their visits to our website, and use this information to improve our website experience, products, and services. For example, we use Google Analytics to help us understand how our customers use the Site — you can read more about how Google uses your Personal Information at https://www.google.com/intl/en/policies/privacy. You can opt-out of Google Analytics at https://tools.google.com/dlpage/gaoptout. We may also share Personal Information with consultants and related companies for internal business or research purposes. Our website may provide registration and contact forms in which we ask for Personal Information. We may use this information to send you information about our website and programs. We do not give this information to third-parties who may send you information about their products and services and promotional material. We may offer free, electronic newsletters and announcements. We will not divulge your subscription to our newsletter mailing list to any third-parties, including advertisers or partners. If you subscribe to one of our email newsletters and then decide you do not want to continue receiving such email newsletter, please use the unsubscribe link, which is included will all email newsletters and appears on our home page, and you will be automatically removed from the corresponding email list. We may from time to time run sweepstakes and contests in which we ask for Personal Information such as your name, email address or telephone number. This is so we can let you know if you win. Sometimes we request additional Personal Information such as your age and gender. We may require this additional information in exchange for allowing you to enter the contest. We may use the contest entry information that we collect to notify you if you are a winner, send you information about our website and programs or give to third-parties who may send you information about their products and services and promotional material. Your participation in any such sweepstakes or contest will be subject to the official rules and regulations of such sweepstakes or contest. If you win one of our sweepstakes or contests, we may require your permission to publish your name, hometown, or other Personal Information on our website. We reserve the right to cooperate with government and law enforcement agencies engaged in investigations of activities that are, or which we believe may be, illegal. Further, we may share your Personal Information with such agencies if we believe that a crime or any act that endangers the health and safety of others may have been or may be committed. We may also share your Personal Information in response to an appropriate subpoena. If you are a European resident, you have the right to access the personal information we hold about you and to ask that your personal information be corrected, updated, or deleted. If you would like to exercise this right, please contact us through the contact information below. When you create a user account or profile through the Site — such as when placing an order — we will maintain your Personal Information for our records unless and until you ask us to delete this information. You can also delete or modify this information by logging in and updating your profile. No information should be submitted to or posted on our website by users under the age of 13. Individuals under the age of 13 are not allowed to become registered users of our websites or participate in any sweepstakes or contests. If an individual between the ages of 13 and 17 submits or posts information to our website, we may collect such information (including personally identifying information). This information may be used for marketing and promotional purposes by us. If a user or his/her parent or guardian changes his/her mind with respect to such use, that user, parent, or guardian may stop such use either by email request or by modifying his/her registration information online. Any Personal Information you give us is kept in secure database files. Access is limited to the few employees who have a need to know. We would like to tell you that your information is as safe with us as it is in your own head, but as crackers/hackers have proven worldwide, no transmission of data over the Internet is guaranteed to be completely secure. Although highly unlikely, it may be possible for third-parties who are not under our control to intercept or access transmissions or private communications unlawfully. While we strive to protect your Personal Information by all possible means, we cannot ensure or warrant the security of any information you transmit to us. Any such transmission is done at your own risk. The most any website can do is make reasonable efforts to protect your information from theft, misuse, and alteration, which is exactly what we do. 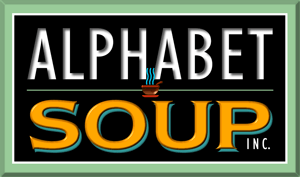 Under no circumstances, including but not limited to negligence, shall Alphabet Soup be liable for any special, incidental, or consequential damages that result from the use of the information or materials on our website, even if we (or an authorized representative of ours) have been advised of the possibility of such damages.